[F]ormer US President General Dwight D Eisenhower called for more troops to be sent to Vietnam to bring about a swift end to the conflict. He told the US News and World Report that the war had been 'going on too long' and said America should be 'putting in the kind of military strength we need to win' as soon as possible. 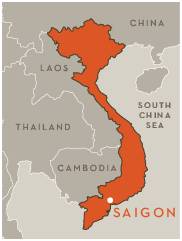 U.S. involvement would end with the fall of Saigon 9 years later. By that time, according to the BBC, an estimated 900,000 Viet Cong and North Vietnamese, 50,000 Americans, and 400,000 South Vietnamese had died.